Home > Breasts > What are Mammograms? Many women will be advised at some point in their life to undergo a mammogram, this can strike fear in many women and cause unnecessary distress. Essentially a mammogram is like taking a photo of the breast. 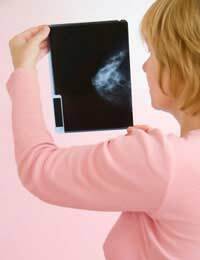 Using x-ray technology a machine can take a series of images of your breasts allowing the professionals to see if there are any signs of cancer within the tissues. The power of the X-ray allows images of the deep tissues of the breast to be visualised. As the breast tissue changes in structure in the presence of higher levels of oestrogen, those under the age of 35 will probably be advised to have an ultrasound performed instead of a mammogram. A mammogram may be requested if you have found a lump in your breast and have informed your GP. This is an early screening process that is used for thousands of women and will determine if the lump if suspicious and if further testing of removal is required.Mammograms are used routinely as part of the screening and early detection programs for all women between the ages of 50 and 70. Most women are extremely nervous about having a mammogram performed not just because they are scared of the possibility of cancer being found, but because they must show their breasts to the members of the healthcare team. These people are professional and see a vast amount of breasts of all shapes and sizes and will be more concerned about making you feel more comfortable and at ease than what sort of breasts you have.Where possible they will allow you to keep your breasts covered up but the actual mammogram requires the breasts to be naked. The mammogram can be quite uncomfortable for some people as the breast tissue must be squeezed between two metal plates, one at the top and one at the bottom, in order to obtain a clear x-ray. This may involve the patient having to lean forward slightly or and alter her position until the perfect position is found. This will need to held for a few minutes while the image is obtained; the pressure from being squeezed is not harmful to breast tissue. Recent research has shown that detection rates are higher if two images are obtained; one from the top aspect and one from the side aspects so it is recommended that women have the breast put between the plates on each side also. This may require the patient to need to raise her arms up out of the way. It is important to tell the doctors if you think you may be pregnant or if you have any problems standing or changing position.The images are assessed by the doctor and the results will normally be discussed with you within 14 days.Very early breast cancers may not show up on the images, so it is important to attend all of the appointments that are sent to you. Mammograms are very important in the breast screening stages. It can mean that cancer is detected early and treatment will be more successful. They are also useful for identifying the exact location of the tumour allowing for more accuracy during surgery if needed.